As much as it is to a picnic, a rainy day is a nemesis to auto racing. While road racing tours such as Formula 1, sports car and even (on limited basis) the IZOD INDYCAR racing series have developed counter-measures like rain tires, windshield wipers and defoggers that allows the competition to continue in most weather, events running on oval tracks are still held at the mercy of nature. Impractical and unsafe even when using any current technology, it is mostly stock cars (specifically those of NASCAR) that suffer the severe effects of precipitation. While rain delays and postponements are far from unexpected by drivers, teams and fans of NASCAR, one major event ran a frankly defying streak of delivering a race on the day scheduled. Since their inaugural event at Daytona International Speedway in 1959, the tour now known as the NASCAR Sprint Cup stock car series has competed at the Daytona 500 on Sunday. In fact, in 53 years, the Daytona 500 has run to the full 200-lap distance on all but 5 occasions. Once scheduled to a shortened 450-mile distance in 1974 due to an oil crisis, the other 4 occasion in 1965, 1966, 2003 and 2009 were due to rain past the halfway point in the Daytona 500 race. For 53 runnings, the Daytona International Speedway appeared to have control over the most uncontrollable elements. Building an incredible winning streak for fans to expect to see their favourite stock car drivers compete on the 2.5-oval track, the streak ended at 53 this weekend. Despite several attempts to jet-dry the asphalt racing surface over a four-hour period, a stubborn weather system sailing through Daytona Beach continued to defeat any effort. 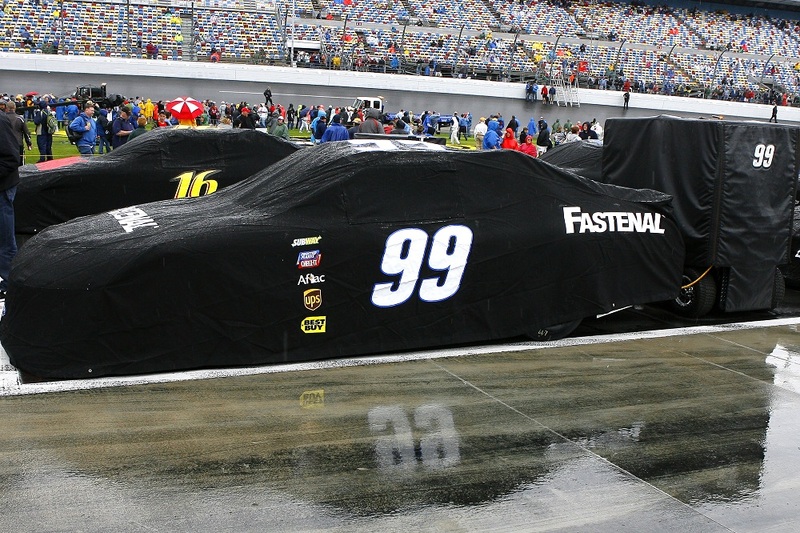 Thanks what turned out to be three-quarters of an inch of rain through the course of the afternoon on February 26th, the Daytona 500 was postponed for the first time. On Monday, NASCAR will attempt to start the Great American Race at noon-time eastern. Unfortunately, forecasts call for an elevated chance of precipitation throughout the afternoon Monday(between 70-90 percent). Thunderstorms are also predicted as likely on Monday's during the attempt to start the Daytona 500. NASCAR and Daytona International Speedway does have optimism that rainfall may slow or cease long enough to dry the track sufficiently for competition. Set to start the 2012 NASCAR Sprint Cup season, drivers, teams and fans will hope the green flag drops at noon Monday.